The Governor Morehead School for the Blind project created a sensory garden for visually impaired and blind pre-school children that contains landscaping to create four sensory quadrants: smell, sound, taste and touch. 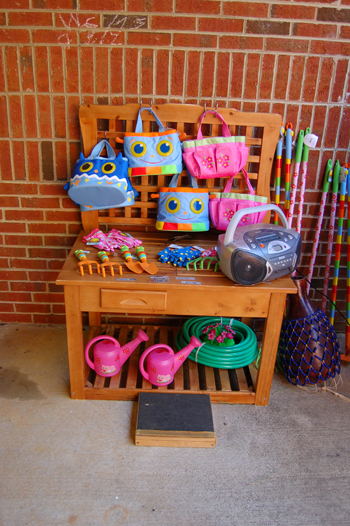 Installations included a garden bench, a mosaic, wind chimes, birdhouses, herbs, tactile plants, soil, ground coverings, bird feeders and birdbaths. February 2007. NC89. RALEIGH – A ribbon cutting marked the opening of a Sensory Garden for visually impaired and blind pre-school children on Monday at Governor Morehead School. The garden is a gift of a 21-member leadership team from the WorldLegacy. “We are happy to receive this wonderful gift from the WorldLegacy’s leadership team,” said Cyndie Bennett, director of the Office of Education Services of the Department of Health and Human Services. “This will provide our preschool children with year-around opportunities to experience the smell, sound, taste and touch of its components. A group of more than 50 volunteers created the preschool garden on Jan. 27 in space set aside on the GMS campus near the preschool. Cash and material donations of about $8,000 combined with the volunteer manpower to create the garden, which includes a bench, wind chimes, a birdhouse, herbs, tactile plants, soil, ground coverings, bird feeders and bird baths. Among contributors are John Deere Landscapes, treestogo.com, Smith & Hawken, The Mulch Masters, Target and three Chatham County artists: potter Rusty Sieck, mosaic artist Hannah Barnum and metal sculptor Tamera Mulanix. 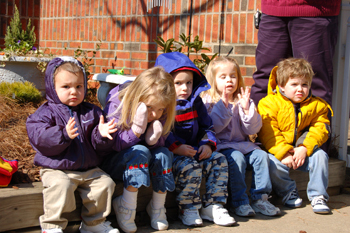 The Governor Morehead Preschool provides community-based early intervention and preschool services to children ages birth through five years with diagnosed visual impairments. Services are provided in collaboration with a variety of other agencies and interventionists to ensure that each child’s unique needs across all areas of development are addressed. In all settings, a strong emphasis is placed on the provision of service in natural environments. Our WorldLegacy NC89 Leadership team accomplished something extraordinary. The evening before NC 89 was to complete our garden at the Morehead School for the blind, we got a call that the principal hadn’t gotten a form signed and we would have to postpone the building for another weekend. We got together for an emergency team call. Rather than distress or figure out how to cancel the whole thing on a Friday night, we figured ways that it COULD happen. We had one team member go talk to a school official. We sent another to talk with the teacher, etc. The principal responded a few minutes later saying he was going to do whatever it took to let it happen the next day. He totally handled it. The workday went off without a hitch. It was an act of extreme giving and extreme makeover. Building a sensory garden for the blind and visually impaired children at the Governor Morehead preschool was one of the highlights of my WorldLegacy NC leadership experience. The way people responded and really wanted to help make a difference in the world was inspiring. People were so generous with their time and we created an amazing garden. Our team members just boldly asked for donations of time, money or sweat and the community said how much do you need? I guess you never know what is possible until you go out there and ask! I am very glad to be on a team like this.